Polytechnic of Namibia contributes to Namibia's development by providing tertiary technological career-oriented education at internationally recognized standards. The main objective of our curricula is thus the practice, promotion and transfer of technology. Ibo Zimmermann was born and schooled in Kenya. His career started in 1975 in South Africa, conducting research for the Savanna Ecosystem Project at Nylsvley Nature Reserve. He then went to work for Botswana’s Department of Wildlife and National Parks, based in Maun. In 1987 he participated in a permaculture design course taught by Bill Mollison in Serowe, followed by permaculture outreach at various settlements in Ghanzi District. 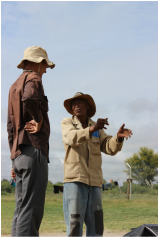 In 1992 Ibo moved with his family to Windhoek, to teach courses such as Agroecology and Rangeland Management at the Polytechnic of Namibia, where he is still based. His students gain practical experience by facilitating farmers to conduct trials, usually with environmentally friendly farming practices.